There are plenty of reasons to love your dog. They always give you a great welcome when you return home, their love is unconditional, and they help you keep fit by exercising them. Unfortunately, along with all the benefits, there is one downside to owning a dog, and that is the mess they can make on your carpet. We’re not just walking muddy paws, but also the odd ‘accident’ which sometimes occurs. Now we’re not suggesting you get rid of your carpets, after all, they make a room look aesthetically pleasing and help keep you warm in the winter. However, with the help of a professional carpet cleaning company such as Carpet Cleaning Kings, it’s easier to care for your carpets and keep them looking as good as new. No matter how well you’ve house trained your dog, accidents can and do happen. The earlier urine is dealt with, the easier it is to remove from your carpet. Unfortunately, many pet owners scrub away at a urine stain and end up spreading it. In addition, the odour often remains. It’s best to soak up a urine stain while it’s still wet using paper towels or a clean white cloth to blot up the moisture. To neutralise the smell try mixing white vinegar with water and pouring onto the affected spot. You do need to ensure the mixture reaches the very bottom of the carpet to be effective. Let the solution sit for around 10 minutes before blotting once more with paper towels. Once your carpet had dried you should sprinkle a little baking soda over the affected area, leave for a few minutes and then vacuum it up. Unless you’re lucky enough to have a dog that doesn’t moult you probably find a lot of pet hair all over your carpet which can be tricky to remove. The average household vacuum tends to get clogged up with all the hair. An alternative is to try removing it by hand with a brush but this is time-consuming and ineffective. Unfortunately dogs can pick up fleas from walking in long grass and these can fall of them and breed in your carpet. It’s often hard to spot them until you discover that you have flea bites all around your ankles. The best way to avoid this from happening is to ensure that your pet is regularly treated with a medication which kills and repels these troublesome pests. In the event that you still find your home is infested then the best thing to do is call on the professionals for assistance. Here at Carpet Cleaning Kings we use the hot water extraction method of carpet cleaning which is recommended by most carpet manufacturers. This method of cleaning gets deep down into the bottom of your carpet removing and extracting all manner of dirt, dust, allergens, and bugs. 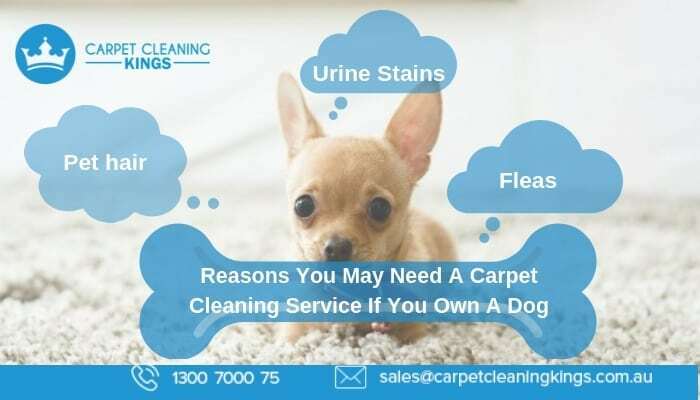 In cases of hard to remove stains and pet hair, we have the necessary chemicals and powerful vacuums to deal with these problems, leaving your carpet fresh and clean. Regular carpet cleaning when done properly can extend the life of your carpet by a couple of years and leaves it looking good all year round. If you need help with pet-related carpet problems then we can help. Call us on 1300 7500 75 to request a free quote or to make a booking. Can Allergies Be Helped With Hot Water Extraction Carpet Cleaning?